The battered city of Baghdad hides an astounding story of which few people are aware. The life of its busy streets has not always been accompanied by bombings and devastation. Its birth takes us back to t time when Magic was part of everyday life. Although its location was the site of several human settlements since the second millennium BC, the foundation of the city itself dates back to the 8th century. Caliph Al-Mansur (714-775 AD), second ruler of the Abbasid dynasty, wanted to build a majestic capital for his reign, for the city of Damascus in Syria still had the memory of its former Umayyad rulers. It was thus that the new Caliph, after careful exploration of the region, decided to establish his capital to the east, in a splendid place bathed by the waters of the Tigris and protected by the shadow of date palms. But a good geographical location was not enough. In order to begin the work, he had to choose the right time by consideration of the influence of the stars to ensure long-term stability and strength of the city. That was how the magical founding of Baghdad was conceived. The work was carried out by two reputed astrologers of the time, the Persian Naubakht Ahvazi and the Jew Mashallah ibn Athari. Both sages worked, along with a handful of students, in the long process of selecting a promising day and time to begin building the city. They made extensive calculations of celestial movements and positions, in an age where all operations had to be performed by hand. When searching for a suitable date in advance, they made use of their knowledge in Elective Astrology, that branch of celestial art in charge of choosing the most favorable astrological moments to successfully perform some important task. Used by the Babylonians for almost all civil and religious activity of a certain magnitude, the Caliph could not but use it for his great city. Like everything in this Hermetic science, astrological choices are based on the principle that the end is hidden in the beginning, so that the outcome of any enterprise depends on the quality of the time in which it began. Hence, with regard to the construction of a city, it is imperative to start the work at a duly selected moment. While Mashallah and Naubakht sought the most suitable astrological moment, the latter’s family helped to design the city, drawing inspiration from the Sassanid capital of Gur, today Firuzabad, in Persia. They decided to give a circular shape to the floor, emulating the celestial vault and the movement of its luminous inhabitants, for just as the square represents the earth, the circle always evokes the sky. Circumference is the fundamental symbol of cycles, where time and motion are linked to the beginning and end of everything. It is the perfect figure par excellence, with its infinite sides equidistant from the invisible center, from which all possibilities of manifestation flow. In the circle we find the base of the oriental mandala, symbol of the universe and the graphic synthesis of the totality. A thousand years ago, the Baghdad plant was perfectly round for a compelling reason: it was thought to be a reflection of Heaven on Earth, bringing Paradise down. It is speculated that the planimetry of the city may have been expressly designed to shape the celestial order by the arrangement of palaces, mosques and other public buildings, reflecting in the earth the positions of the stars for the day of its foundation. The idea of organizing the layout of the buildings according to an astronomical pattern was not new for the time. The Egyptians had already disposed much of their buildings following a scheme of celestial imitation, as the engineer and researcher Robert Bauval demonstrated in the 1990s. Although this type of thesis is not easy to prove, it is not crazy either, although it tends to raise bitter controversies with the most orthodox archaeologists and historians. In any case, the extension of the present city has more than surpassed the original circular plant, becoming a good example of this so typical modern disorder, a chaos in constant expansion that attends to nothing more than to demographic and economic pressures. In the 8th century, you can imagine, archetypal principles were attended that, by elevation, reflect a harmony and beauty that we have lost in our crowded and alienating cities. And what day did the astrologers choose to found the city? In order to answer this it is inevitable to complicate matters a little and resort to the technical language of astrology. The chronicle recorded by the Persian mathematician and astrologer Al-Biruni indicates that the work began sometime on Saturday, July 31, 762, but he does not mention the time to lift the horoscope, as the astral chart does not have the cusps pointed out. However, knowing the rules of the art, it is possible to find the exact time and restore the angles of the figure. 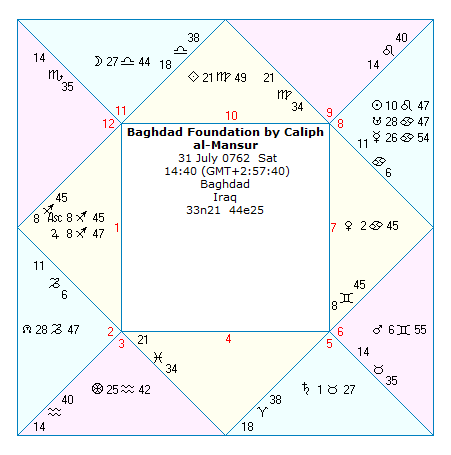 Given this, the team of astrologers could only have chosen 14:40 local time for the meridian of Baghdad. At that moment Jupiter was highly strengthened in his regency and term of Sagittarius, in hayz and stationary before turning direct, located right on the Ascendant. These factors are providential for traditional astrology, announcing political stability, economic prosperity, development of science and the arts, promotion of education, as well as justice, tolerance and cultural diversity. The astral chart in question was correctly found by the linguist and astrologer James H. Holden, to whom we owe the magnificent work “A History of Horoscopic Astrology”. Unfortunately the Moon, which is fundamental in every elective chart, is peregrine, void of course and in via combusta on the horoscope of Baghdad, but the astrologers probably tried to mitigate these afflictions with two mutual receptions to Venus and Saturn, sadly not very effective because their lack of aspect, and a beneficial applicative trine to the Part of Fortune. However, we must remember that no astrological choice is perfect. Due to the great complexity of the firmament, it is inevitable that some negative factors will develop. Mars, the planet of war, opposes Jupiter and the Ascendant from the Seventh House, which among other things governs enemies. No wonder then that Baghdad was besieged and ravaged by the invasion of the Mongols under Hulagu Khan in 1258. The hordes of the steppes were brutal, killing most of its inhabitants and burning the city. In 1401 it was destroyed again by Timur, and in the following centuries had to endure the invasions of the Ottoman Turks. 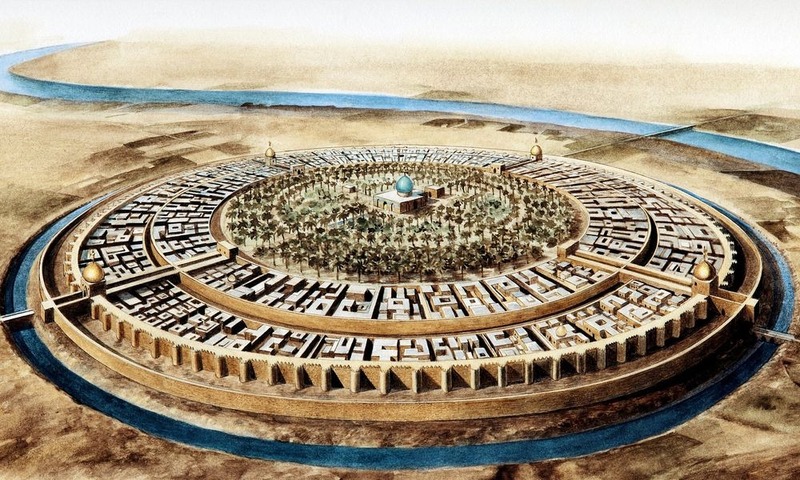 It is ironic from a modern perspectice, that the round city of Baghdad was formerly known as Madinat as-Salam, the City of Peace. What is not taken into account is that the Abbasid capital was the jewel of civilization, knowledge and culture for half a millennium. 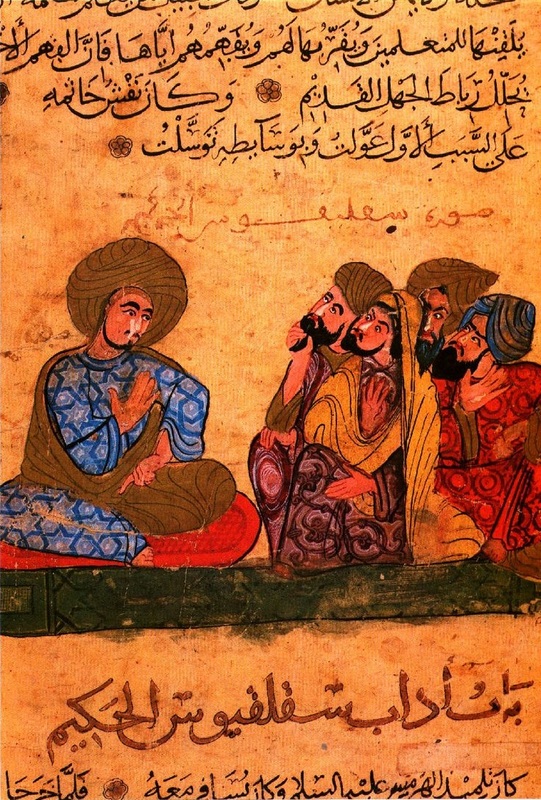 The well-known Caliph Harun al-Rashid, great-grandson of Al-Mansur and fifth in line of succession in the dynasty, was who, next to its son and successor Al-Ma’mun, raised in the city the House of Wisdom (Bait Al-Hikmah), the most important center of studies of the time, with an extraordinary library where hundreds of translations were made to render the Greek philosophers into Arabic, along with the rishis of India, the wise men of Egypt and the Magicians of Persia. It was a kind of emulator of the great library of Alexandria in the heart of Iraq. Alchemy, chemistry, medicine, mathematics, astronomy, astrology, botany, zoology, geography and cartography were developed. Plato, Aristotle, Plotinus, Euclid, Hippocrates, Galen, Charaka, Sushruta, Aryabhata and Brahmagupta were translated, among many others. There worked the greatest scholars of the Middle East, such as the mathematician Al-Khwarizmi, the philosopher and polymath Al-Kindi, the renowned doctor Hunayn ibn Ishaq and the astrologer Thabit ibn Qurra. It was the golden age of Islam. In the House of Wisdom, Jews, Christians, Muslims, Sabeans and Zoroastrians met, leaving aside all their sectarian differences, joining forces in the pursuit of knowledge. Baghdad was the richest city in the world and the intellectual beacon of its time. It came to have more than one million inhabitants, being the most populated city of its time. The stories of The Thousand and One Nights were told in its streets, while the song of the muezzin was heard from the minaret of the mosques, which rivaled in beauty with the walls of Babylon or the Mausoleum of Helicarnassus. In their observatories the movement of the stars were measured, in their taverns mystical poetry was recited, while in their gardens politics, philosophy and theology were discussed with the sound of the lute and the nay flutes behind. Let us not forget either that it is precisely in this same region of the globe that civilization itself arose, where writing, wheel, brick, agriculture, sailing, gardens, even the notion of city was invented. Iraq is the very cradle of science, religion and culture. The plunder and destruction of this long war, now transferred to the tribal and sectarian realm, has caused an irreparable loss for humanity. There are thousands of archaeological pieces that have disappeared in the midst of the war, fundamental parts of the history of humanity, not to mention the atrocities that have had to suffer the people of the country. The hordes of Mars are back, this time with bullets, drones and explosives. On the other side, religious fanaticism boils explosively, contributing to the destruction But Baghdad will rise again, as it has done many times in the past, or at least we hope so.